Mecalux has installed an automated warehouse for boxes with a storage capacity of 3,460 boxes in the warehouse that Continental owns in Planta Periférico (Guadalajara, Mexico). This set up includes the Easy WMS warehouse management system that controls incoming goods and outgoing finished orders, while also ensuring maximum throughput in picking orders. Founded in Hanover (Germany) in 1871, Continental develops innovative technologies and services orientated to sustainable mobility and the interconnection of people and their merchandise. The technological company provides secure, efficient, intelligent and affordable solutions for vehicles and machinery, traffic and transportation. The Planta Continental Periférico Guadalajara required a storage system set aside for small-sized products that, also, would speed up picking. Bearing these needs in mind, Mecalux supplied an automated warehouse for boxes that offers a storage capacity of 3,460 boxes of 400 x 600 mm. In these, they house spare parts and car accessories (a good part of these are electronics). The warehouse is composed of two aisles with double-deep racking on both sides. It is 22 m long, 9 m high and has 20 storage levels. A miniload stacker crane runs through the aisle in charge of inserting and extracting the goods in their locations automatically. This machine works at a travel speed of 250 m/min and 90 m/min when raised, thus achieving a potential above current needs and which will meet future company growth. 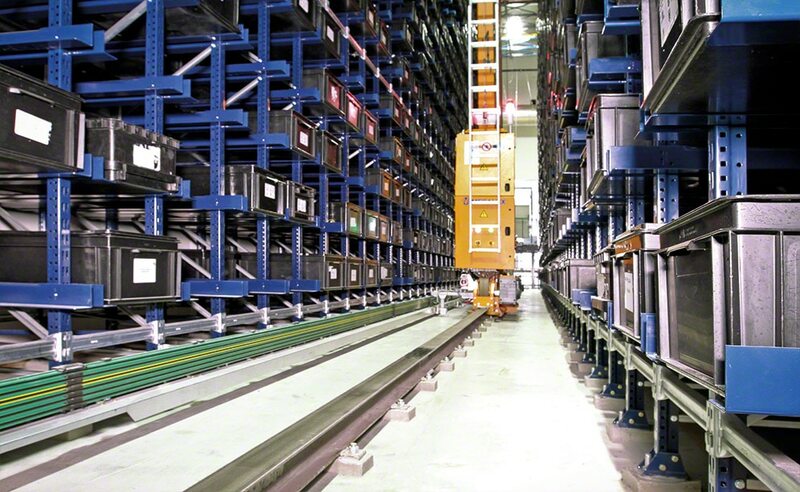 At the front of the warehouse, a double conveyor circuit connects the storage aisles to two picking stations and makes box recirculation possible. The conveyors run at a speed of 45 m/min. Above the conveyor circuit, a raised platform is installed that facilitates access by authorised personnel to the storage aisles to carry out maintenance work. The aisle is protected and enclosed with mesh panels and safe access doors that, if they are opened, cut power to the stacker crane and stop it from working. There are two U-shaped picking stations where operators receive boxes flowing from the warehouse. On a screen, the Easy WMS by Mecalux tells workers to take out certain products, which they then place into the corresponding order. Finished orders are grouped into carts that can hold waves of 24 orders. The picking stations also act as replenishment positions during off-peak hours, when less order picking work is done. This eliminates any interference between the two operations. To achieve maximum productivity and picking speeds, the automated warehouse is managed by the Easy WMS of Mecalux, tasked with ensuring everything runs smoothly. This system carries out different operations, including location assignments and storage of boxes keeping their turnover in mind, as well as the extraction of goods, sending them to picking stations and order picking tasks. The Galileo control module by Mecalux updates the devices with movements to carry the goods from one position of the warehouse to another in a completely safe manner. Fully used space: the Continental warehouse in Planta Periférico (Guadalajara) has a storage capacity of 3,460 boxes that are 400 x 600 mm in size. High throughput: the automatic stacker cranes ensure very high inflows and outflows, which facilitates the preparation of a large number of orders. Smart management: both the Mecalux Easy WMS warehouse management software and the Galileo control module are capable of organising all the processes and operations carried out in the warehouse.